Pilot Printing has long experience providing support to (arch)dioceses and parishes for major educational, formational, and development initiatives, working in concert with multiple offices and agencies to provide design, printing, and distribution services across a full slate of collateral materials. We’ve listed several of the most high profile initiatives with which Pilot Printing has assisted. Every Lent and Advent season the Archdiocese of Boston encourages all Catholics to receive the Sacrament of Confession and adds a consistent time to receive the sacrament in every parish (Wednesday evenings from 6:30-8pm). To help the Archdiocese of Boston promote the initiative, Pilot Printing designs, prints and distributes the promotional items to all parishes in 3 languages. Catholics Come Home is a national evangelization campaign for Catholics who have been away from the Church to return, and to share inspiring messages about the Catholic Church with everyone (practicing Catholics, lapsed Catholics, non-Catholics). As part of the campaign in the Archdiocese of Boston, Pilot Printing customized all printed materials from the national CCH campaign for archdiocesan parishes. Language(s): English, Portuguese and Spanish. 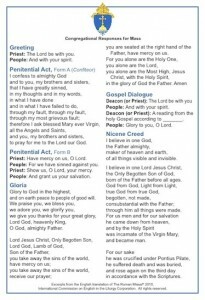 On the First Sunday of Advent, November 27, 2011, every Catholic parish began celebrating Mass using the new translation of the Roman Missal. 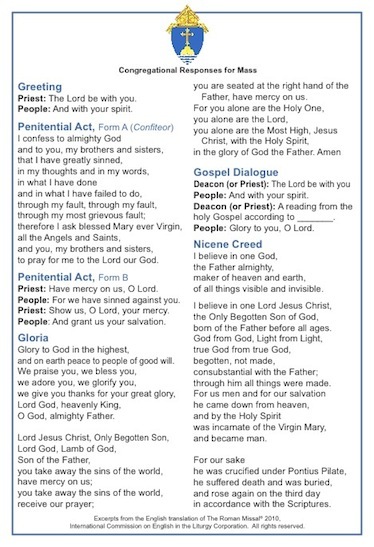 Pilot Printing, in cooperation with the Office of Worship of the Archdiocese of Boston, prepared attractive pew cards containing all the congregational responses which are prayed during the Mass. The cards act as an aid to congregations as they become familiar with the new responses at Mass. Pilot Printing also customized pew cards for the dioceses of Fall River and Worcester, as well as for individual parishes elsewhere. Diocese(s): Boston, Fall River and Worcester. Individual parishes in other dioceses. Task(s): Design, print, and distribe. 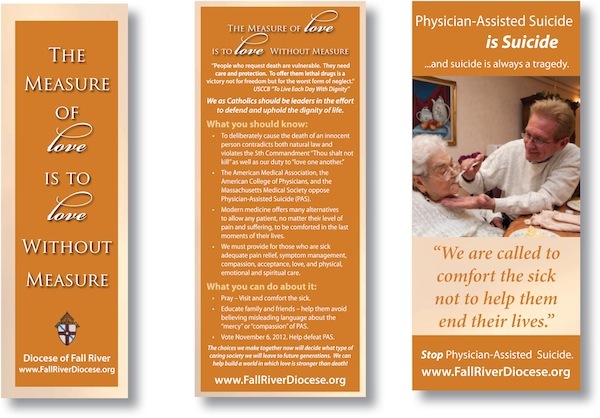 The Archdiocese of Boston, Diocese of Fall River and Diocese of Worcester launched educational campaigns to inform the parishioners about the November 2012 ballot initiative on Physician Assisted Suicide in the Commonwealth of Massachusetts. 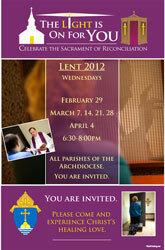 Pilot Printing helped to promote these campaigns by designing all printed materials for distribution to the parishes. The materials included pew cards, prayer cards, parish informational guides, pocket folders, posters and other items to help parishes better serve their parishioners and educate them on the facts of Physician Assisted Suicide. Task(s): Design, translate, print, and distribute. Cardinal Sean O’Malley wrote two pastoral letters in 2011. The first, released on June 12, 2011, was focused on Evangelization and titled “A New Pentecost: Inviting All to Follow Jesus”. 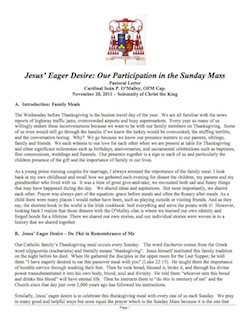 The second, released November 20, 2011, was titled “The Importance of Sunday Mass Participation”. Pilot Printing designed and printed these letters on high-quality paper in a booklet format and distributed them to parishes. Small and large print editions were made available to better suit the needs of parishioners in multiple languages.